We proudly provide year-round, small group instruction in our warm indoor swimming pool where parents can watch their children’s progress from the comfortable viewing gallery. We operate a perpetual schedule. Customers have the flexibility to begin and end classes based on their needs. We accept customers any time! Simply prioritize days and times that work for your family, and then give us a call to see what’s available. Below you will find important information related to our swim lessons. This section includes answers to some of our most commonly asked questions. We ask our customers to commit a minimum of 8 weeks. Once you are registered, you will maintain your same day and time until you decide you need a break. All we require is 30 days notice signed by the customer. We never charge registration fees! Call us so we can do a preliminary assessment and check class availability. 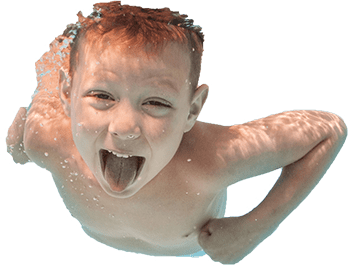 For children who are new to swimming, we recommend our Jump Start Program, where your child attends classes 2 times per week for a minimum of 8 weeks. The cost is $158 per month. Every summer we offer a condensed program where swimmers attend a class every day for 2 weeks, Monday thru Friday starting Late May and lasting throughout the summer. We offer levels Aqua Toddler thru Aqua Pro. These are ideal for families who have out of town travel plans during summer or want to accelerate their child’s learning. Ready to get started? We can help you select the right program for your child. Complete our contact form or give us a call today.